J. B. Were And Son. : 1839-1948. (Melbourne, Stuart Taylor Pty. Ltd, Fine Printers, c.1948). . First Edition; 4to; pp. (14) un-paginated; numerous b/w illustrations throughout; original stiff stapled wrapper, a good copy. J.C.W. 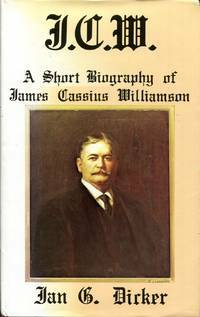 : A Short Biography of James Cassius Williamson. N.S.W., The Elizabeth Tudor Press, 1974.. First Edition; 8vo; pp. xii, 212; illustrated endpapers, portrait frontispiece, 36 b/w. illustrations, bibliography, index; hardback, dustjacket, light browning to pages, otherwise a very good copy. J.C.W. 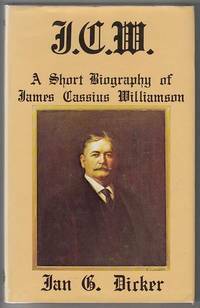 A Short Biography of James Cassius Williamson. (Rose Bay, Elizabeth Tudor Press, 1974).. First Edition; 8vo; pp. (xiv), 211; colour portrait frontispiece; numerous b/w illustrations; illustrated endpapers; acknowledgements, list of illustrations, bibliography, index; dustjacket; minor foxing to pages, page edges flecked, small tears on dustjacket, a good copy. J. C. Williamson Ltd Magazine. 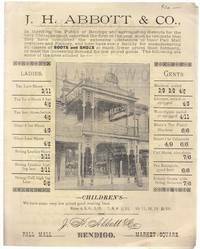 (Printed by Whitmarks Ltd, Sydney for the Publishers, City Ads Ltd), n.d.. 4to; pp. 40; b/w. illustrations, adverts; stiff stapled illustrated wrapper with minor wear, writing in black on front wrapper, good copy. 4to; pp. 64; b/w. illustrations, colour illustrations, adverts; stiff stapled illustrated wrapper with minor wear, staples missing from wrapper, writting in black on front wrapper, contents seperate from wrapper, otherwise a good copy. (Sydney, Mortons Ltd.), n.d.
4to; pp. 34; b/w. illustrations, adverts; stiff stapled illustrated wrapper with minor wear, centre double page loose from pages, writting in black on front wrapper, a good copy. (Sydney, Mortons Ltd), n.d.
4to; pp. 64; b/w. illustrations, colour illustrations, adverts; stiff stapled illustrated wrapper with minor wear, centre double page loose from pages, writting in black on front wrapper, a good copy. 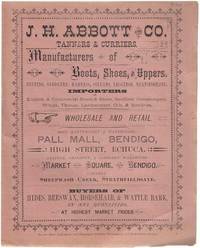 (Sydney, Mortons Ltd), n.d.
J. H. Abbott and Co. Tanners & Curriers. : Manufacturers of Boots, Shoes, and Uppers. Bendigo, Bolton Bros, n.d.. 4to; unpaginated (8); original stiff wrapper, missing staple, edges of wrapper chipped, a good copy. J. H. Abbott and Co.
Bendigo, Bolton Bros, n.d.. 4to; unpaginated (4); original stiff wrapper, corners of wrapper chipped, a good copy. Bendigo, Bolton Bros, n.d.. 4to; unpaginated (8); stapled paper wrapper, a very good copy. J. Hewat McKenzie. : Pioneer of Psychical Research. A Personal Memoir. London, The Aquarian Press 1963. . First UK Edition; 8vo; pp. 157; b/w frontispiece, original blue cloth with title in gilt on spine, dustjacket, index, minor foxing to top of title page, otherwise a near fine copy. J. M'Douall Stuart's Explorations Across The Continent Of Australia With Charts. 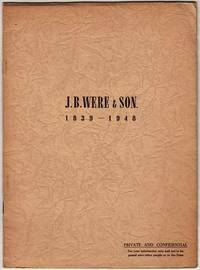 1861-62.: South Australian Facsimile Editions No. 4. Adelaide, Public Library of South Australia, 1963.. Facsimile Edition Deluxe Issue of 99 copies, this copy No. 38; 8vo; pp. (iv), 97; folding map at front, original red cloth, title lettered in gilt on spine, a fine copy. 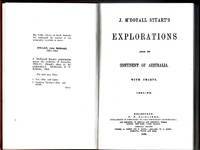 Fascinating reading about Stuart's explorations which made it possible to lay the Overland Telegraph Line and his poor treatment by the Government of the day..
Adelaide, Public Library of South Australia, 1963.. Facsimile Edition; 8vo; pp. (iv), 97; folding map at rear, original red cloth, title lettered in gilt on spine, a good fine copy. Fascinating reading about Stuart's explorations which made it possible to lay the Overland Telegraph Line and his poor treatment by the Government of the day..
Adelaide, Public Library of South Australia, 1962. Facsimile Edition; 8vo; pp. (iv), 97; folding map at rear, original red cloth, title lettered in gilt on spine; previous owners name to front free endpaper, otherwise a very good copy. Adelaide, Public Library of South Australia, 1963.. Facsimile Edition; 8vo; pp. (iv), 97; folding map at rear, original red cloth, title lettered in gilt on spine; minor browning to front endpaper and last few pages; edges of pages slightly browned, otherwise a very good copy. 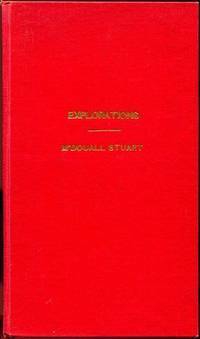 J. McDouall Stuart's Explorations Across The Continent Of Australia With Charts 1861-62. Adelaide, Friends og the State Library of South Australia, 1996.. Limited Facsimile Edition; 8vo; pp. [xiv], 97, [iv] adverts; large folding map; original red cloth with quarter leather binding, previous owner's bookplate to front endpaper, a fine copy. Limited Edition of which 99 copies are bound in quarter leather. J. R. Simplot. : A Billion the Hard Way. Idaho, Caxton Press, 2000. . First Edition; 8vo; pp. xxxii, 251, 32 pages of b/w photographic plates, bibliography, index; original cloth, title lettered in gilt on spine and front, dustjacket, a very good copy. Jaberanda & co.: Living in the Twentieth Century 1950-2000. (Paynesville, Jaberanda Books, 2001).. 8vo; pp. viii, 120; numerous b/w illustrations; stiff illustrated wrapper, a fine copy. Jabiluka. 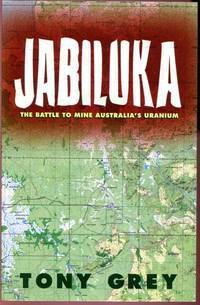 : The Battle To Mine Australia's Uranium. Melbourne, The Text Publishing Company, (1994).. First Edition; 8vo; pp. (viii), 305; 8 b/w plates, index; stiff illustrated wrappers, slight browning to edges of pages, otherwise a very good copy. 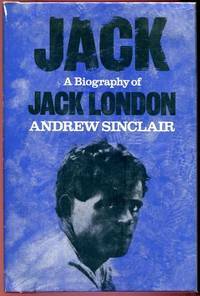 Jack, A Biography of Jack London. London, Weidenfeld & Nicolson, (1978).. First Edition; 8vo; pp. (xvii), 297; illustrated with 21 b/w photographs, notes to chapters, selected bibliography, index; original red boards, dustjacket, speckling to top edges, otherwise a very good copy.